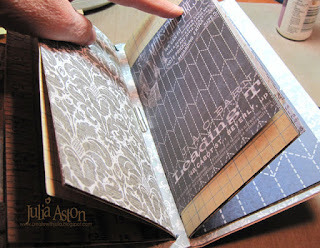 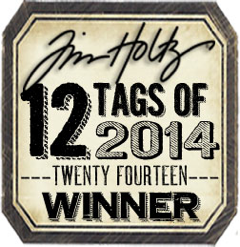 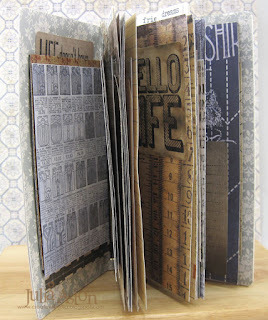 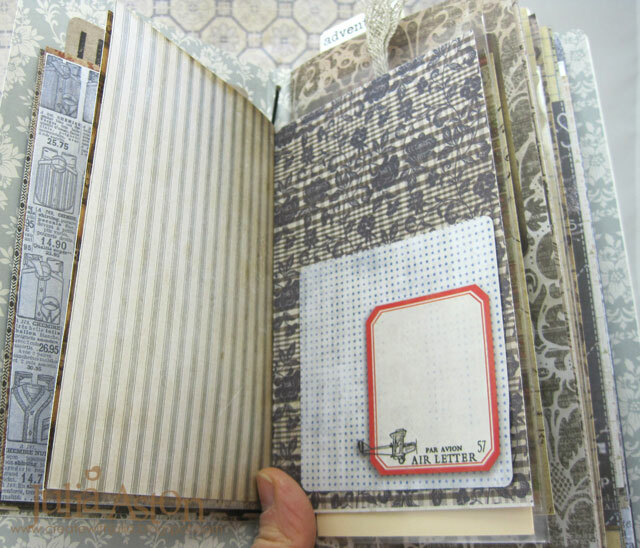 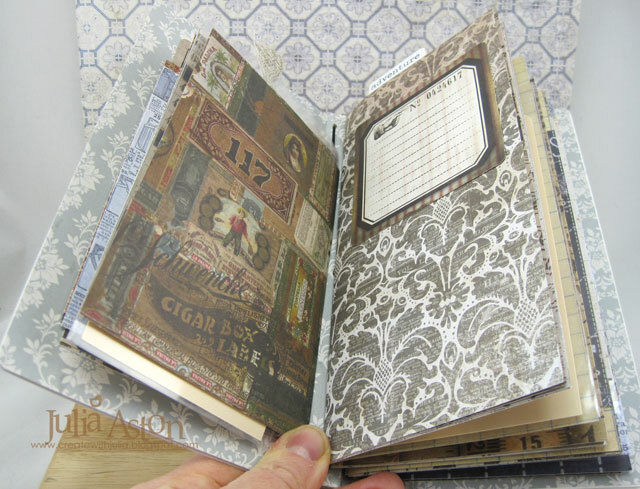 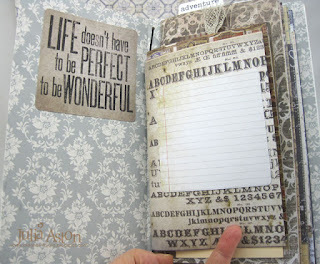 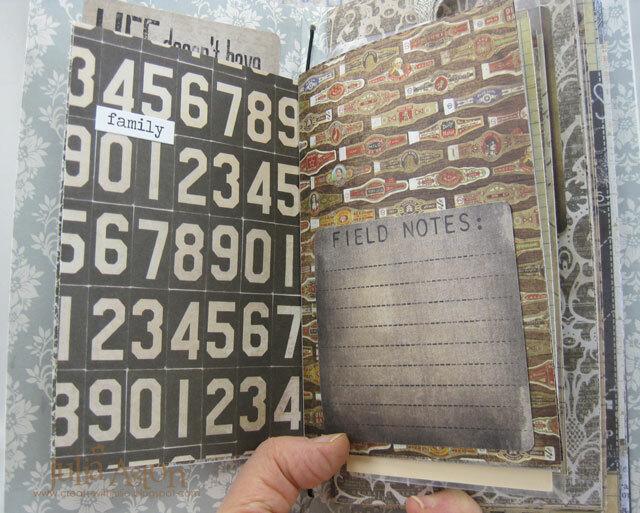 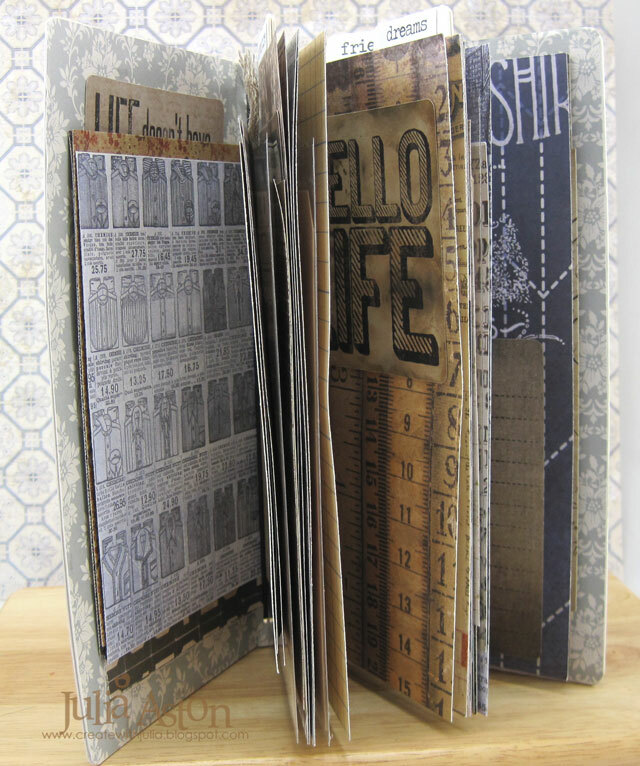 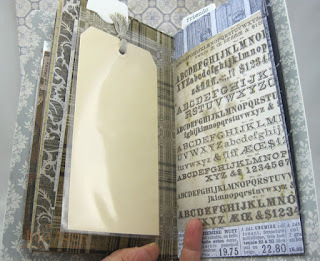 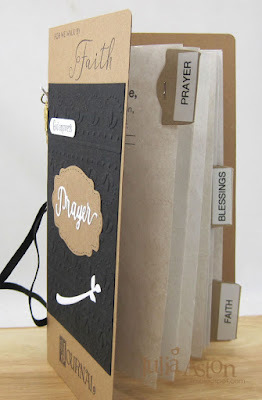 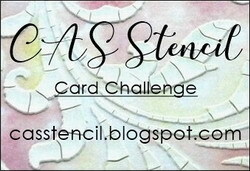 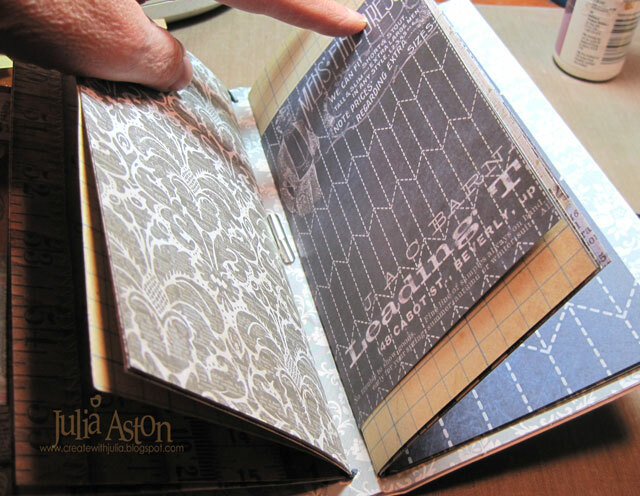 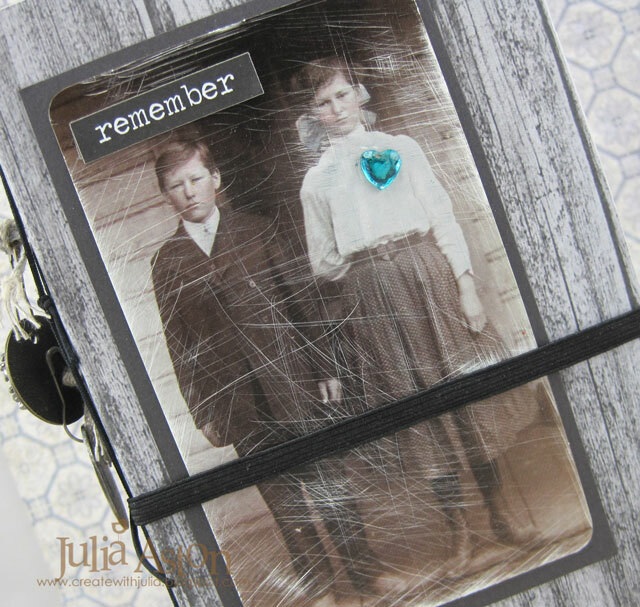 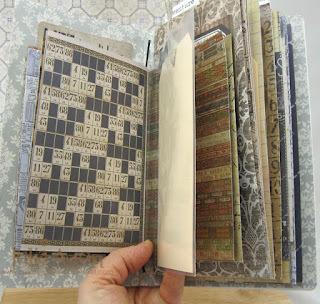 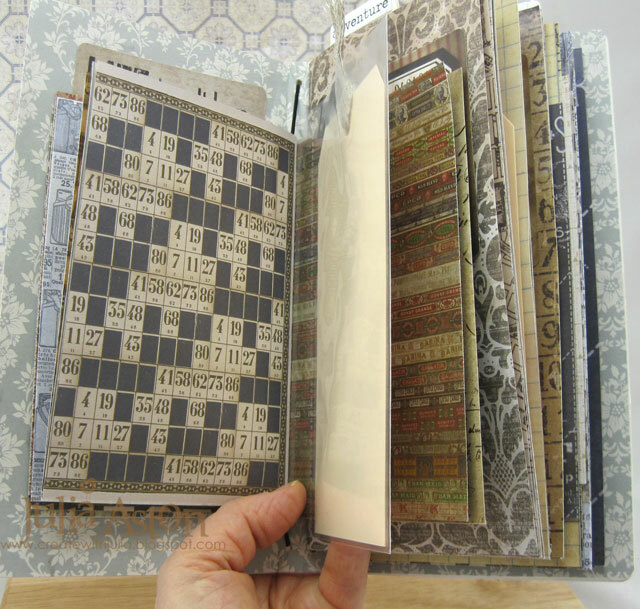 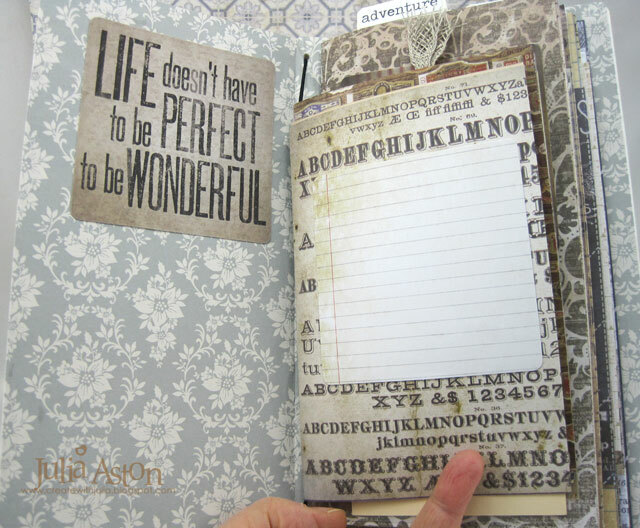 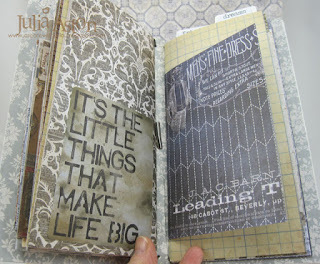 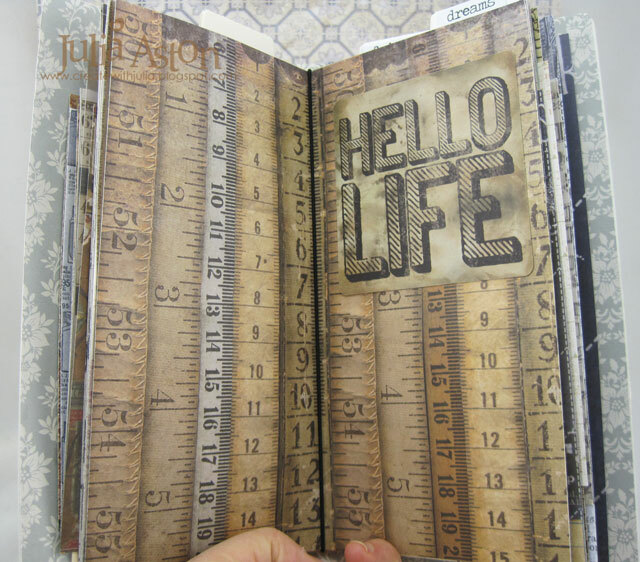 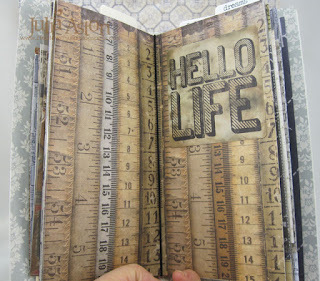 A Junk Journal - New Journal Sizzix Die by Eileen Hull! 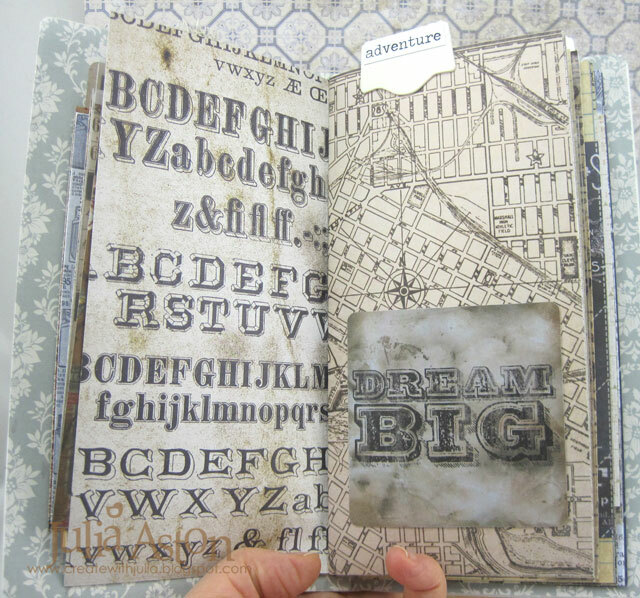 I made a junk journal to share with you today to show you how fun and versatile this die is! 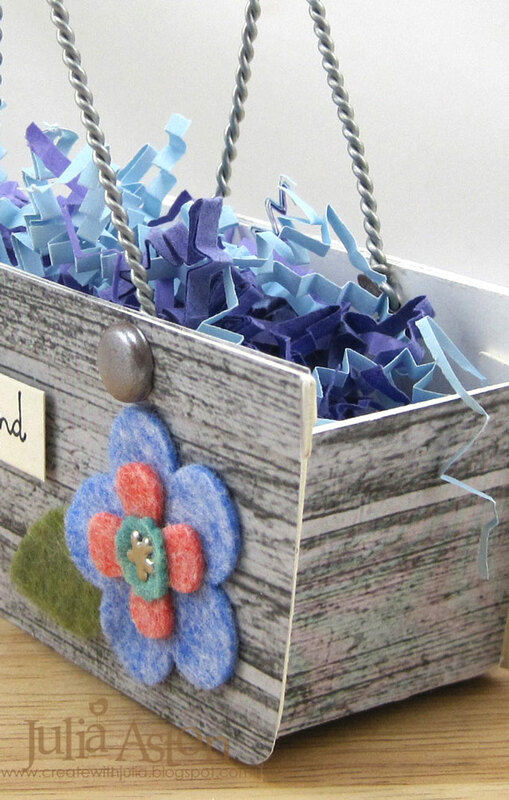 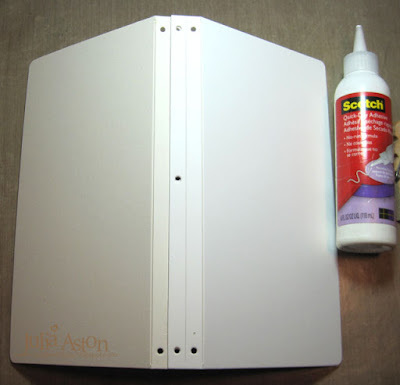 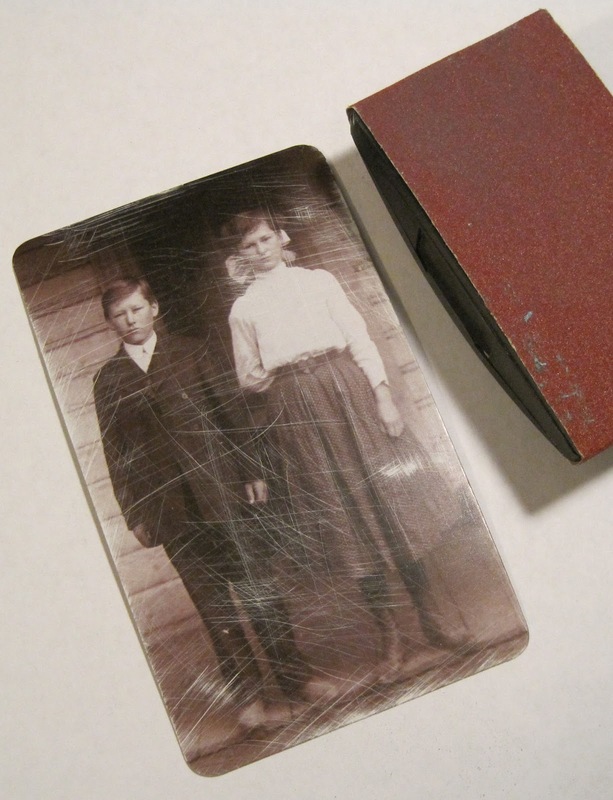 If you like to make journals - you are definitely going to want this die! I have lots of photos to show you just how I put this together. 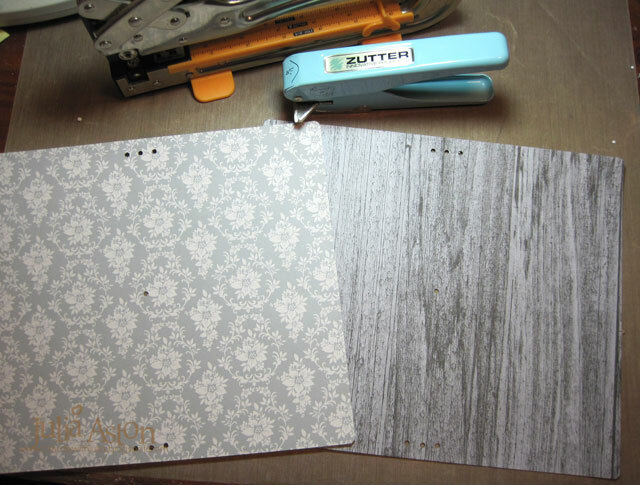 Cut two pieces of patterned paper 10" x 8 1/2". 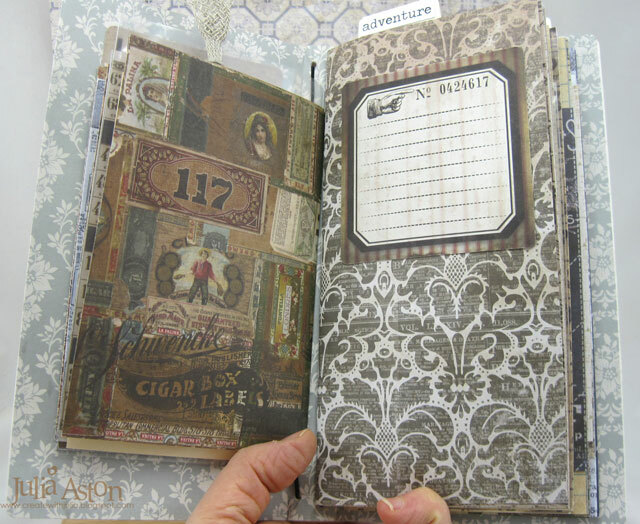 I used papers from DCWV Cranberry Christmas - a pretty damask and a woodgrain. 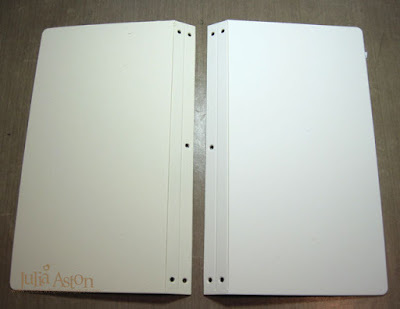 Mark where the holes are and punch them out. Round the corners with a corner punch. Adhere the papers to the cover being sure to line up the holes. 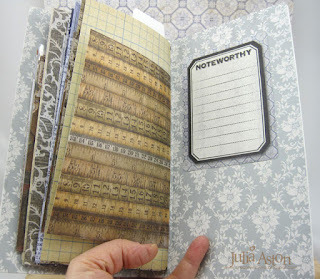 Push an Idea-ology Elastic Loop through the center hole so that the loop is on the outside. 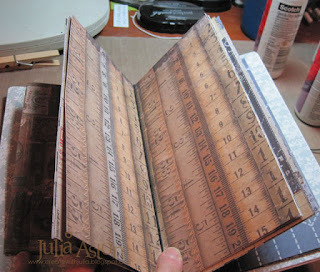 This will hold the Journal closed. 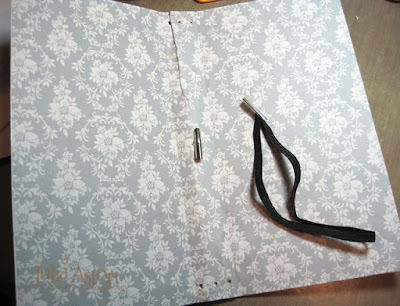 You could also just use a piece of round cord elastic and tie a knot in it. Sand over a Found Relative to age the surface. 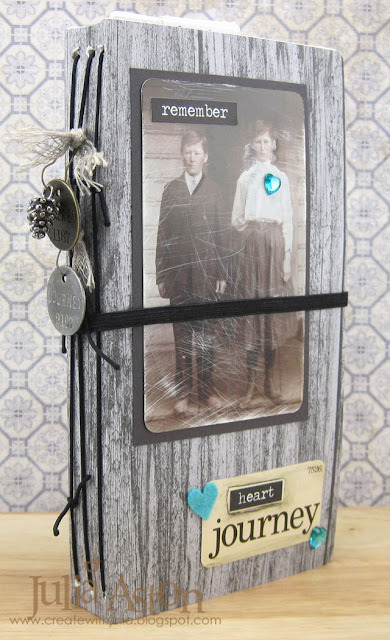 Layer the photo to a piece of card stock, add a Big Chat sticker and a Mirrored Heart, color the cheeks of the children with a Spun Sugar Distress Marker and color the girls bow and blouse with a Weathered Wood Distress Marker. 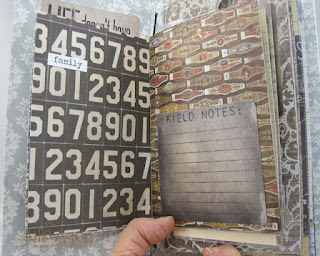 Adhere this to the cover. 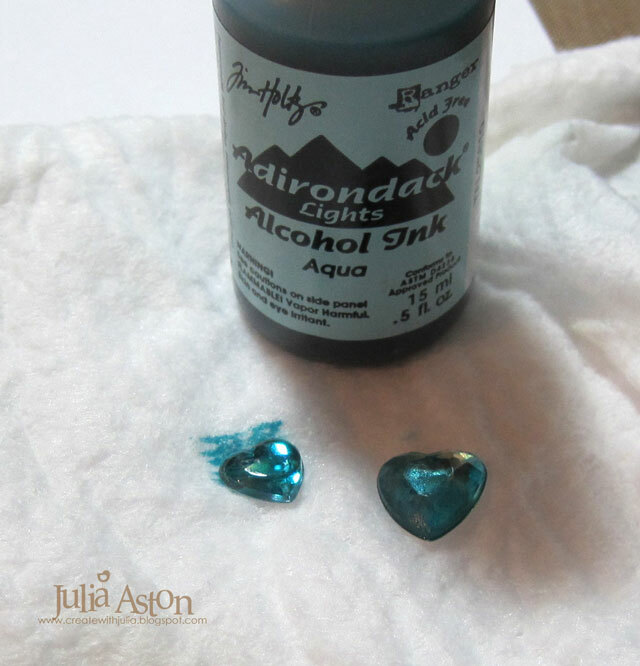 I colored the Mirrored Hearts with Aqua Alcohol Ink. 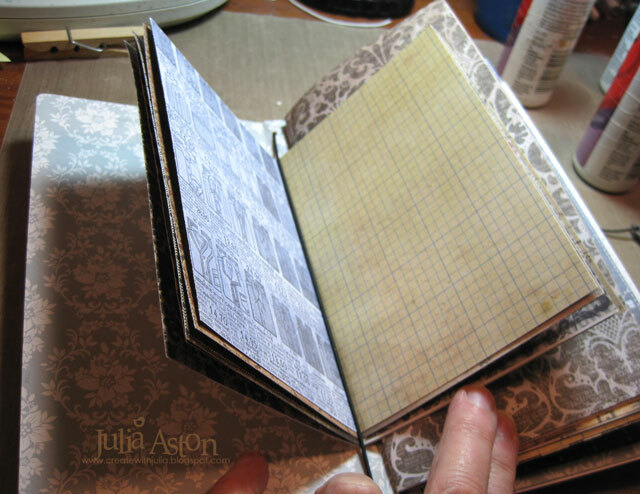 Cut 8 pages of patterned paper 8"x8" and fold in half to create 8"x4". 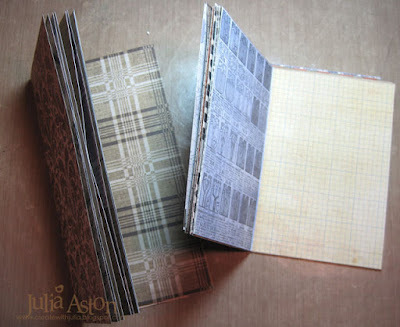 Cut 8 pages 8" x 6" and fold in half to create 4" x 6". 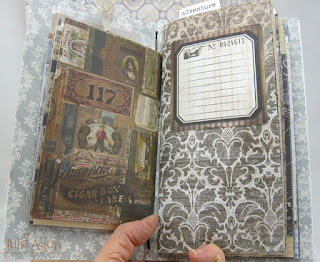 I used papers from Paper Stash Dapper by Tim Holtz. Cut 3 15" pieces of round cord elastic and tie each one through the holes in the folder, pulling them tight and knotting them on the outside. Divide your papers into 3 groups (mix up the sizes or however you prefer) - and slip them under the cords in the middle of each group (called a signature). 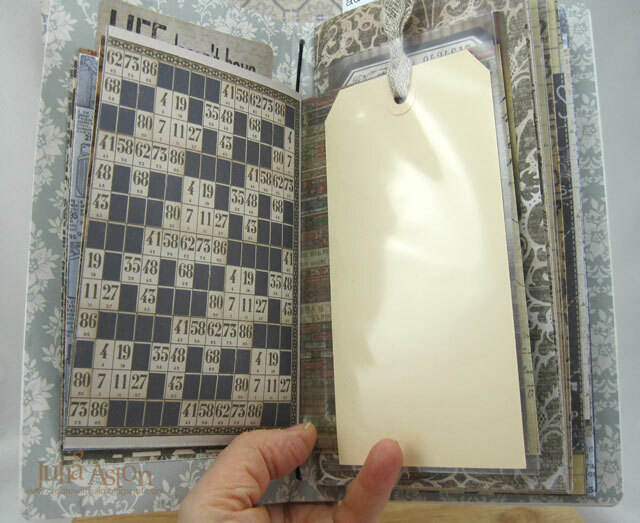 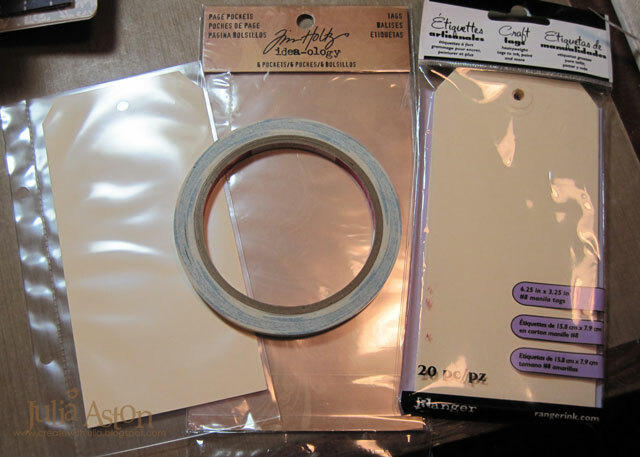 The elastics hold the pages in - but they can also be removed or added to easily using this method. 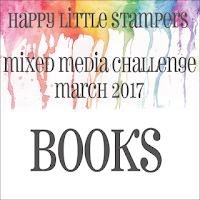 I added Idea-ology Flash Cards, Pocket Cards, and Big Chat stickers to my pages, highlighting borders with a Black Stabilo Pencil and rubbing with my finger. 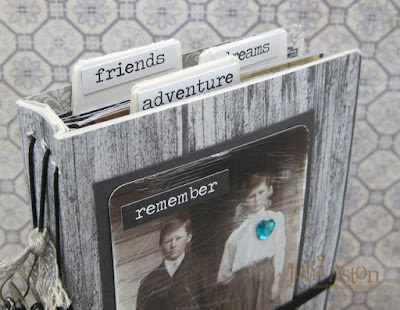 I added Page Pockets and Tags to some of the pages for notes or places to insert other mementos, depending on what I use this journal for. 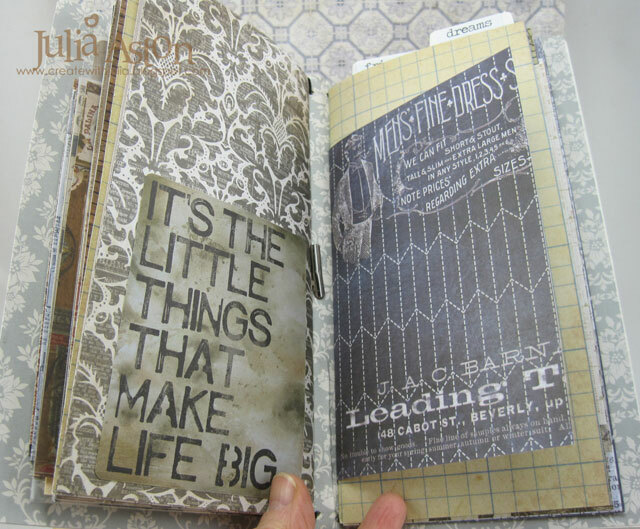 The Journal Die has some tabs on it - I added a few to the tops of some pages and labeled them with Idea-ology Big Chat stickers. 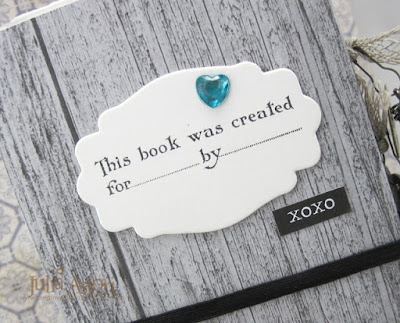 The Journal Die also has a label on it - I put this on the back, stamped it and added another Mirrored Heart. The stamp is called Story of Me by Clear Art Stamps I'm not sure if it's still available - it's been in my stash for a long time! 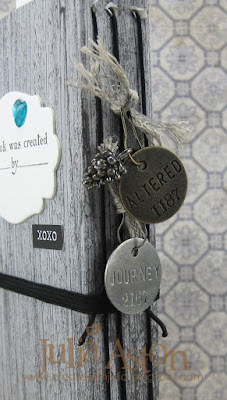 To finish off my Journal - I added a Pine Cone Adornment, Philosophy Tags with Loop Pins and a knot of Linen Ribbon. Now I just need to fill up the pages! 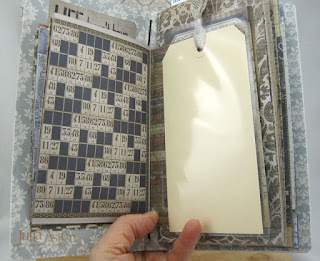 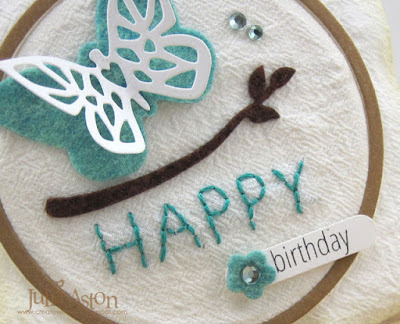 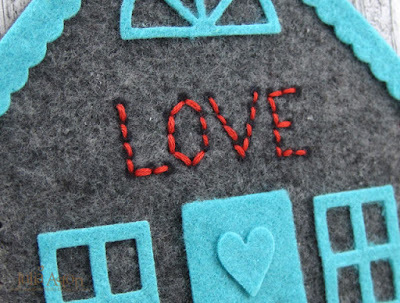 Please check out Eileen Hull's blog all this month for more wonderful projects using her Sizzix dies! 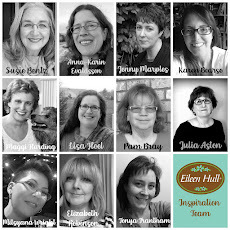 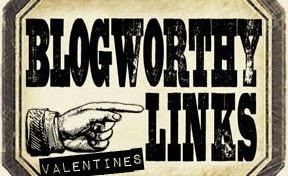 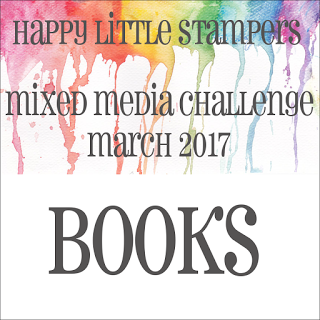 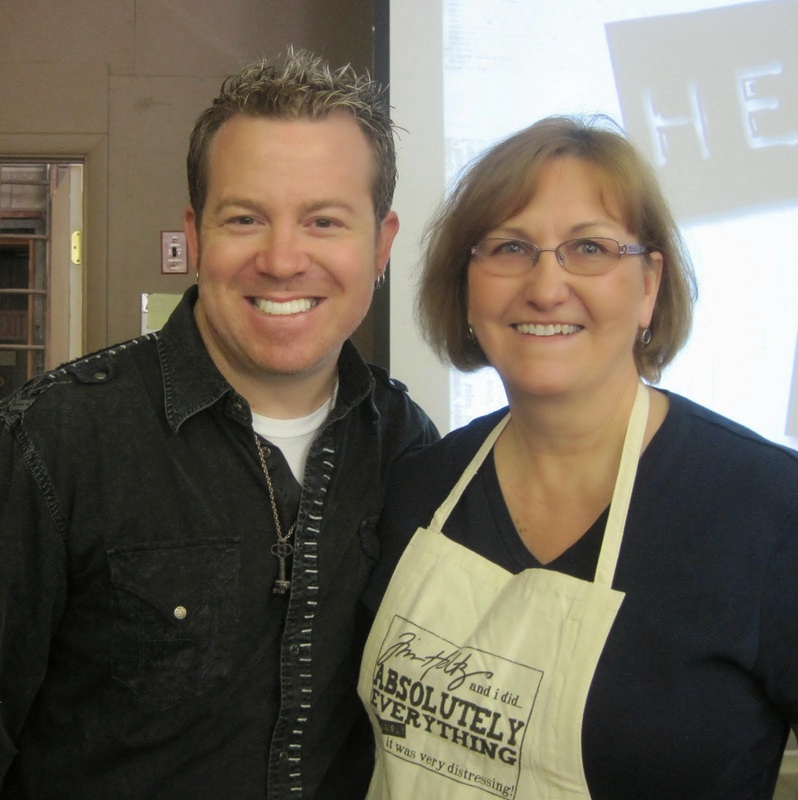 You may have seen the deluge of posts on Facebook by myself and the rest of Eileen Hull's Sizzix Creative Team members. 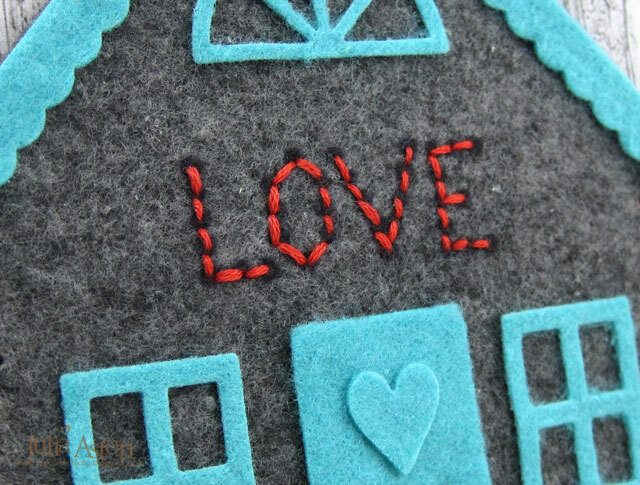 The Creativation Craft Show (formerly known as CHA) is being held in Phoenix, AZ from Jan 19th - 23rd this week and Eileen will be there with her trailer 'Scotty' right on the showroom floor - running 'make and takes' and displaying all of the team's creations using her new Sizzix Dies and other products. Here are sneak peeks of the projects I created for her. 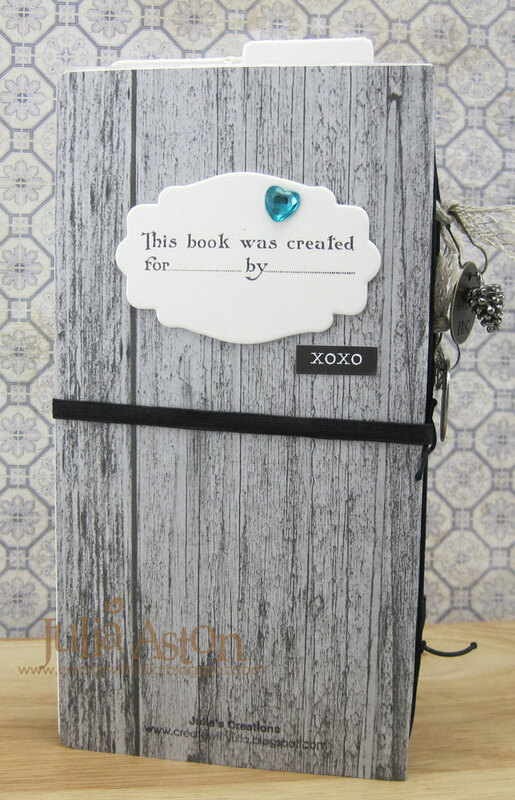 I will be posting full posts with tutorials in April after the new products are available for purchase! 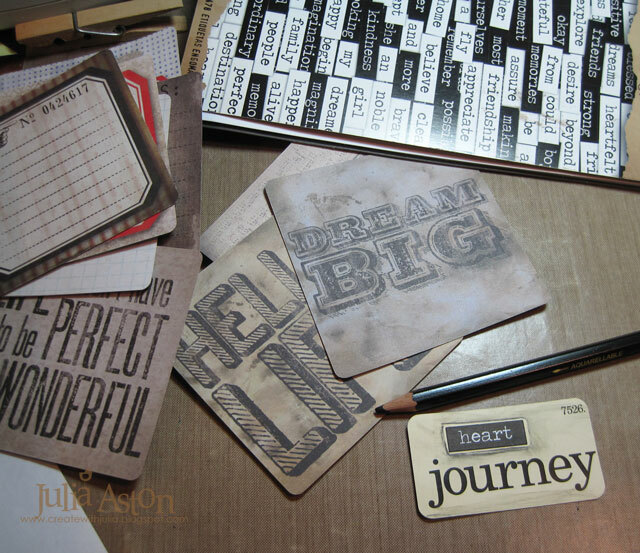 If you are lucky enough to go there this year - please check out Eileen's Sizzix Booth - and let me know if you saw any of my projects!